A particularly attractive Mountain Ash, Pink Pagoda (Sorbus hupehensis 'Pink Pagoda) is a larger tree than the standard Hupehensis. This means that it will reach a final height of 20m (66ft 8in). 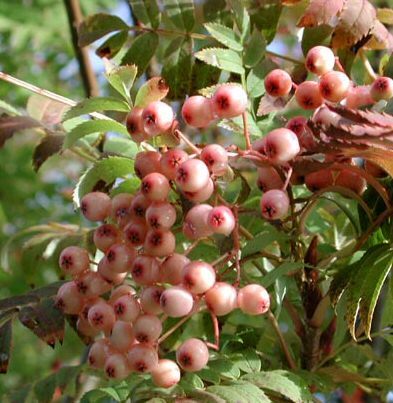 This tree carries multiple clumps of pink berries which gradually turn a striking white colour in late winter. Also of note are its dazzling autumn colours which complement the greenish-blue large pinnate leaves. Pink Pagoda is supplied at a height of between 1.5m (5ft ) and 1.8m (6ft) in a 12L container, which means that the tree has an already established root system and therefore this tree can be planted any time of the year and with better results than either bare-root or rootballed trees.